By Keith Cowing on February 28, 2010 11:41 PM. "As reported on these pages earlier this week, some folks inside NASA and in Congress say ATK has been behind the sniping at NASA's deputy administrator Lori Garver. The not so-thinly veiled broadside against her in Precourt's email appears to lend further credence to the charges. It's hard to understand how this will help ATK going forward as some could see it as a declaration of war on NASA's political leadership and is almost certain to strengthen Garver's hand. Perhaps ATK decided that with the shuttle being retired and Constellation on the brink it has nothing left to lose." Keith's note: It is openly known here in Washington that ATK has been overtly encouraging anti-NASA gossip and has been trash talking the White House, Charlie Bolden, and Lori Garver - especially Lori Garver. How ATK management can possibly expect this thinly disguised attack behavior to be good for business escapes me. Indeed, it sounds more like sheer desperation on their part. By Keith Cowing on February 28, 2010 11:33 PM. "Criticism of Mr. Bolden's actions came from unexpected directions. Various lawmakers typically supportive of NASA requests said they were "floored" or shocked by the budget package. Complaining that the agency provided only "vague assurances that [astronaut] safety will not be undermined" by the new plan, Rep. Pete Olson, a Texas Republican who represents many NASA employees, confronted Mr. Bolden. He said NASA's leader "managed to surprise, frustrate and anger those of us who have been your greatest advocates." "The objections fall into two broad categories--lack of a clear destination in space for the new program, and a "faith-based" belief, in the words of one House member, that a commercial route to orbit for U.S. astronauts is better than the government-managed Ares I and Orion vehicles. Members also are irritated by delays in getting specifics of the broad-brush plan released Feb. 1, and the apparent lack of consultation outside of a small administration circle in the decision to make such a "radical" change away from a space policy Congress has endorsed." By Keith Cowing on February 28, 2010 7:40 PM. "As NASA administrator Charles Bolden makes his two appearances on Capital Hill this week, it has become ever more clear that NASA's Constellation program is going away, despite the protestations of some people in Congress. Constellation, the space program's next generation of rockets and spacecraft, is managed at Johnson Space Center. Although the mood there is rather dour as one might expect, it is well known that geeks, myself included, respond to stress with gallows humor. And so it goes with Constellation." "In the place of the canceled Ares and Orion hardware, we now have increased support for education, increased spending on the discredited global warming hypocrisy and subsidies to several new commercial rocket companies. And, oh yes, don't forget a new outreach program to Muslim countries without established space programs. In canceling Constellation with nothing to take its place, the president is saying the U.S. should not have its own human space program and is directing funds to the Commercial Orbital Transportation Services program, or COTS. If NASA wants to participate in human spaceflight, it will have to be through contractors." By Keith Cowing on February 28, 2010 7:38 PM. "Lew Jamieson is the president of the Machinist Union at the Kennedy Space Center. He's been there for 32 years. "It's a community issue and that is why we are here today. It's an attempt to bring the community [together]. They need to recognize they can make a difference," he said." "In the bitter cold ...thousand rallied. "Are you ready to fight? yeah!!" Their signs cut to straight to the point...."clunkers three billion, NASA zero Many of these NASA employees say the presidents plan to eliminate funding for space flight operation is the wrong move." "I don't want to see our astronauts get suited up and get on Russian or Chinese spaceships," said John Kroening, 50, a nonunion production control worker with United Space Alliance. "We want to keep the space industry here. We've always been the leader." "We want you to extend the shuttle," should be the message, [District 1 Brevard County Commissioner Robin] Fisher said. "We want you to hold up all votes on everything until Florida is taken care of. If that stops Washington D.C., that's OK."
Keith's note: Good luck with that approach, Robin. By Keith Cowing on February 27, 2010 9:03 PM. "The Space Studies Board (SSB) was requested by NASA to conduct a review of the suborbital mission capabilities of NASA in the NASA Authorization Act of 2008 (Section 505). The act expresses the sense of Congress that suborbital flight activities, including the use of sounding rockets, aircraft, and high-altitude balloons, and suborbital reusable launch vehicles, offer valuable opportunities to advance science, train the next generation of scientists and engineers, and provide opportunities for participants in the programs to acquire skills in systems engineering and systems integration that are critical to maintaining the nation's leadership in space programs. Further, the act finds it in the national interest to expand the size of NASA's suborbital research program and to consider it for increased funding." How Much Will It Really Cost to Cancel Constellation? By Keith Cowing on February 27, 2010 9:46 AM. "Many of the deals are called "undefinitized contracts," meaning that the terms, conditions -- and price -- had not been set before NASA ordered the work to start. That means the agency will need to negotiate a buyout with the contractor -- and that can be a long and painful process, according to government officials familiar with the cancellation process. "It can be messy, and it's going to take at least a year after the project is closed to get a final price tag assigned to many of these contracts," said one congressional investigator not authorized to talk publicly about his work." "Undefinitized contract actions authorize contractors to begin work before reaching a final agreement on contract terms. By allowing undefinitized contract actions to continue for extended periods, NASA loses its ability to monitor contractor performance because the cost reports are not useful for evaluating the contractor's performance or for projecting the remaining cost of the work under contract. With a current, valid baseline, the reports would indicate when cost or schedule thresholds had been exceeded, and NASA could then require the contractor to explain the reasons for the variances and to identify and take appropriate corrective actions. Yet, NASA allowed high-value modifications to the Constellation contracts to remain undefinitized for extended periods, in one instance, more than 13 months." By Keith Cowing on February 26, 2010 5:48 PM. "Spaceflight pioneer Aaron Cohen, a former director of NASA's Johnson Space Center in Houston, died Thursday, Feb. 25, after a lengthy illness. He was 79. 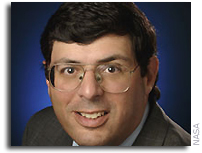 Cohen had a 33-year career with NASA. He was a steady hand at the helm of Johnson as NASA recovered from the shuttle Challenger tragedy and returned the space shuttle to flight. Cohen left the agency in 1993 to accept an appointment as a professor at his alma mater, Texas A&M University. At the time, he was serving as acting deputy administrator at NASA Headquarters in Washington." By Keith Cowing on February 26, 2010 4:43 PM. "NASA is announcing a new initiative to launch small cube-shaped satellites for education and not-for-profit organizations. CubeSats are a class of research spacecraft called picosatellites, having a size of approximately four inches, a volume of about one quart, and weighing no more than 2.2 pounds." "A CubeSat is a type of space research nanosatellite, the base CubeSat dimension is 10x10x11 centimeters (one "Cube" or "1U"). CubeSats typically range from one to three Cubes (10x10x34 centimeters) in volume and typically weigh no more than one kilogram per 1U Cube." "By law and policy, SI is the preferred system of measurement within NASA." Keith's note: Here we are in the 21st Century and NASA still will not adhere to its own - and goverment requirements - and conduct business in metric units. But wait ... they do - in the official solicitation. So ... did someone in PAO translate from metric units back into English units? Wacky. Otherwise: this is a very cool program. By Keith Cowing on February 26, 2010 3:04 PM. "Objections to it fall into two broad categories -- the lack of a clear objective in space for the new program, and the "faith-based" belief, in the words of one House member, that a commercial route to orbit for U.S. astronauts is better than the government-managed Ares I and Orion vehicles. Members also are irritated over delays in getting specifics of the broad-brush plan released Feb. 1, and the apparent lack of consultation outside a small administration circle in the decision to make such a "radical" change away from a space policy Congress has endorsed." "Congressional hostility toward the administration's plans for NASA was so great that three lawmakers who don't serve on the science committee attended Thursday's hearing just to give Bolden a piece of their mind." By Keith Cowing on February 26, 2010 2:48 PM. Keith's note: There is apparently some draft legislation floating around the Senate that addresses the development of Heavy Launch Vehicles (HLV) using Orion and Shuttle hardware at NASA. This thread at NASAspaceflight.com discusses a posting of some draft language on FlightGlobal. Take particular note of postings by "51D Mascot" i.e. Jeff Bingham, staffer on the Senate Commerce Science and Transportation Committee, who notes that the most recent draft of this legislation is dated 22 Feb 2010. By Keith Cowing on February 26, 2010 2:18 PM. "To my friends in the Press... Since the WSJ chose to cherry-pick and miss-quote my comments to Cong Wolf and since the blogs have taken that to further mischaracterized my comments, I am forwarding the Wolf memo in its entirety, in the hopes that some of this gets corrected." "Commercial space pioneer Burt Rutan has sharply criticized Obama administration proposals to outsource key portions of NASA's manned space program to private firms." By Keith Cowing on February 26, 2010 2:05 PM. It has been the long standing policy of United Space Alliance (USA) and its subsidiaries to keep the public informed about company plans, programs, and accomplishments. With the evolution of social media tools and platforms, USA employees have access to participate directly in the free and open discussion of company, industry, and national issues. However, in doing so, employees must understand that their actions can have very real consequences for themselves, the company, and USA's customers. Continue reading Social Media Do's and Don'ts at USA. By Keith Cowing on February 26, 2010 12:25 PM. "Houston stands to lose big. Economists estimate as many as 7,000 jobs could be lost as the space shuttle program is phased out this year and the Constellation program winds down." "Florida, facing the loss of some 14,000 jobs from retirement of the shuttle and President Barack Obama's proposed cancellation of the Constellation program, is widely expected to be an electoral battleground in the 2012 presidential campaign." "Vitter, who also is concerned about the impact on jobs at the Michoud facility in eastern New Orleans, which produces the space shuttle's external fuel tanks, faulted the new budget for "not only ending the shuttle but completely canceling its replacement, the Constellation, with little more than a hope and prayer that commercial providers will eventually pick up the slack." "The local economic forecast tied to President Barack Obama's proposed NASA budget keeps growing bleaker. Revised projections now show that about 23,000 workers at and around Kennedy Space Center will lose their jobs because of the shuttles' retirement and the new proposal to cancel the development of new rockets and spacecraft." By Keith Cowing on February 26, 2010 12:15 PM. "Recently you may have heard about former astronaut Scott Parazynski's adventure to climb Mt. Everest. He carried a sliver of a moon rock from Apollo 11 with him, and then picked up a sliver of a rock from the top of the highest mountain in the world. These two rocks were encased in plastic, handed over to NASA, and flew aboard the space shuttle to be installed in the new Tranquility module of the International Space Station. All very inspiring and good. Now for the rest of the story." By Keith Cowing on February 26, 2010 11:42 AM. "Another milestone passed! Today NASA's New Horizons spacecraft is 15.96 astronomical units (about 2.39 billion kilometers, or 1.48 billion miles) from the Sun - putting it halfway between Earth's location on launch day in January 2006, and Pluto's place during New Horizons' encounter with the planet in July 2015. "From here on out, we're on approach to an encounter with the Pluto system," says New Horizons Principal Investigator Alan Stern, from the Southwest Research Institute. "The second half of the journey begins." By Keith Cowing on February 26, 2010 10:54 AM. "During the Thursday hearing, U.S. Rep. Alan Grayson of Orlando hammered Bolden on where he thinks NASA should send its astronauts next. Bolden said NASA's goal was to send astronauts to Mars but he was vague on when that might happen and where astronauts might go beforehand -- as the new NASA vision aims to develop futuristic new spacecraft, rocket engines and fuel depots before settling on a destination. That response didn't sit well with the freshman Democrat, who often interrupted Bolden before concluding that NASA was "taking a shot in the dark" by relying on commercial rocket companies. "What you are doing is taking NASA's manned-space program and making it a faith-based initiative," Grayson said." Keith's note: Rep. Grayson was being purposefully obnoxious, rude, and snarky today. What purpose that served him escapes me since Bolden's calm professional demeanor certainly made him look like the adult in this little exchange while Grayson came across as an arrogant newbie. "Notably, those speaking out against the changes are not just members of Congress representing Alabama, Florida and Texas -- the homes of the NASA centers that would be most directly affected by the cancellation of the rockets and spacecraft that make up the current program, known as Constellation." "At a U.S. House hearing Thursday, U.S. Rep. Alan Grayson of Orlando grilled NASA chief Charles Bolden on the agency's new plan to send astronauts into orbit. The exchange raised eyebrows throughout the House Science and Technology committee, as the freshman Democrat often interrupted Bolden - and prompted some condemnation in space circles." By Keith Cowing on February 25, 2010 11:56 PM. "The men and women of NASA and their contractors can do anything this country wants them to do. All it takes is leadership -- not management, leadership ... But, we have seen enough of the "in-your-face" style of leadership at the top, and it's high time for some leadership that can make the necessary changes with an understanding of, and respect for, NASA's most important asset -- its people." Continue reading NASA's Most Important Asset, Gerry Griffin, 31 December 1996. By Keith Cowing on February 25, 2010 10:19 PM. "On 9 February 2010 NASA conducted a test to validate an approach that would be used to test the parachutes for the Orion spacecraft. That test did not go according to plan. However, contrary to earlier stories and rumors, a mock up of an Orion spacecraft did not crash into the desert. Rather a large test sledge did. During this test, an extraction parachute pulled a test assembly designed to simulate the drag and weight of Orion from a C-130 aircraft. The test was conducted at an altitude of 20,500 feet above the Army's Yuma Proving Grounds in Arizona. The test assembly consists of a weight tub and platform. Something went wrong, the parachutes did not open, and the test assembly crashed on impact." Keith's note: Of course NASA ESMD PAO hasn't said a thing about this. C'mon Morrie - can't you get these guys to be a little more "open and transparent"? How Do We Do Grand Things In Space Again? By Keith Cowing on February 25, 2010 9:05 PM. "The new NASA budget makes sense for many important reasons. First, the president is signaling that this agency deserves the full support of this administration and Congress, even as priorities are sorted out and other budgets are cut. Second, getting long-range space flight right requires getting near-Earth orbit perfect. Third, forestalling the moon mission in favor of perfecting the technologies that will allow us to reach Mars within some defined period ahead is sound. We should not rush it and experience an avoidable tragedy." "The truth is the public in general long ago stopped paying much attention to what NASA is doing in the manned space realm. There have been some spikes of interest here and there - for Hubble repair missions, to see John Glenn fly or, sadly, for the returns to flight after the accidents - but in general, it's been a long, steady decline that really began on July 24th, 1969 - when the Columbia capsule carrying Armstrong, Aldrin and Collins splashed down in the Pacific. Let's not forget Apollo was never built to be a sustainable program. It was all about the sprint. Is it any surprise it did not sustain public interest?" By Keith Cowing on February 25, 2010 8:05 PM. "The Mars Society is a group that prepares for man's eventual exploration of Mars with simulations in the Utahan desert. But their mission logs, posted regularly on the group's website, reveal a tension that is very real--and very funny. ... According to their "Mission Info" page, they are the first team comprised entirely of Belgians. In the wake of the trouble they've been having, it now seems ominous that the last line of their statement reads, "the media is following our project very closely." By Keith Cowing on February 25, 2010 6:08 PM. "Rep. John Culberson (R-Texas) accused Holdren of not consulting senior NASA personnel on the decision to terminate the Constellation program. "Your associate administrators and field center heads were not even told of the final details of the plan to cancel Constellation until just a couple of days before its release," he said. Holdren denied the accusation. "They were consulted early in the process and during the process about the options, the characteristics of different possibilities," Holdren said. Tensions mounted near the end of the hearing when Wolf accused three White House staff members seated behind Holdren of wearing smug facial expressions during Culberson's final round of questioning. "I don't care who you work for," he said. "I think you really bring a degree of arrogance here that is just almost offensive." "This plan abandons any hope of astronauts actually going anywhere, beyond the station, for at least 20 years. I am aware of the OMB statement of NASA's mission of getting ready to go to Mars. But these science projects should be worked on at the same times as launch systems like Constellation which will actually get us somewhere." By Keith Cowing on February 25, 2010 12:14 PM. Keith's note: There was one bizarre series of events today in the Senate hearing on NASA's budget that I found to be very odd - and a little troubling. I am referring to the series of questions that Sen. Vitter (R-LA) asked of Charlie Bolden with regard to Deputy NASA Administrator Lori Garver. The questions focused on who made the decision to cancel Constellation and whether Lori Garver was at the heart of this. He also seemed to suggest that Lori was pushing to oust Bolden and usurp his job - something he said that he "would not support". Within a few moments it was clear that Vitter had been programmed by his staff with some sort of magic fairy dust and that he was going to pursue a line of questioning that focused on Garver and repeated use of the word "radical" and not on anything of substance related to the budget. Clearly, Vitter's staff were using him as a proxy in a search for a cabal, smoking gun, or a scheming mastermind behind the Obama space policy. Typical Washington blood sport. This is not new: there is a small subculture of space policy wannabes out there who seem to be convinced that Lori Garver has sold her soul in the pursuit of some sort of plan to destroy human space flight and replace it with ... well, they do not agree on that part. The silly thing about all of this is the illogic of someone like Lori ever being inclined to want to "kill" human spaceflight. Quite the contrary. Let me say this. I have known Lori for more than 20 years. If you have read NASA Watch you will know that in the past I have not hesitated to criticize her when I saw fit. But let me tell you, for anyone with a shred of knowledge about Lori and her background to suggest that she is against human space travel - of any kind is ludicrous. Not only did she head the National Space Society, an organization devoted to human space flight, but she spent 6 months of her life training to get a seat on a Soyuz flight as "AstroMom" and even had surgery to meet the medical qualifications. It just doesn't compute. If you want to throw rocks and dabble in second rate Da Vinci code cabal mongering, then go look into the inner workings of OSTP and OMB. That is where these policies were developed and delivered to NASA - not the other way around. As such, I have to wonder what those staffers sitting silently behind Vitter were thinking when they poured this nonsense into his head. Clearly they know how things work here in Washington. But instead of trying to have a serious discussion about the programmatic merits or detriments of the policy, Vitter went off on a wild goose chase - and hit a brick wall. Funny thing: Sen. Vitter never uttered the word "Michoud" as far as I could tell. "Several sources on the Hill, in industry and inside the Obama administration blame rocket maker ATK, the developer of the Ares I rocket first stage, for putting Vitter up to the attack. Sources say that complaints have been sent to ATK and so far there has been no response. In the meantime, members of the Senate and the House said they were going to refrain from any further personal attacks as they move against the White House's proposed 2011 budget for the space agency." Keith's update: "NASA Watch has learned that the impetus for Senator Vitter's remarks about the alleged role of Lori Garver in developing the new NASA plans did not come from his committee staff support, as had been suggested in the author's earlier post." Ok, so that is what a Capitol Hill source asked me to post. I am not sure I totally believe it though. Something smells a little funny about all of this. What I won't post (or hint at) is their identity. Nor will I post the arrogant, snarky, insult-ladden emails that accompanied this. I just love it when these Hill folks send these emails in an official capacity but then demand to control what subset of the information I can or cannot use - all under utter anonymity. But let me tell you - when a Senator gets on the train to Crazy Town like Sen. Vitter did, the people responsible for advising, preparing, and guiding that Senator have failed in their job. Miserably so. By Keith Cowing on February 25, 2010 9:13 AM. "NASA's Fiscal Year 2011 Budget Request and Issues"
By Keith Cowing on February 25, 2010 8:26 AM. "NASA Administrator Charles Bolden said after the hearing that critics were confusing the lack of a specific destination or timetable with the lack of a goal. NASA has a goal, a big one, Bolden said. It's going to Mars. But Bolden added that getting astronauts to Mars is more than a decade away and NASA needs to upgrade its technology or else it never will get there." By Keith Cowing on February 24, 2010 8:52 PM. "While I give the Administration plan high marks for its steely-eyed reassessment of priorities - it did a horrible job telling this story. The headlines should have read: "Space is now open for business". Or - "Space travel now for the rest of us" Or "Space Station science gets a big reprieve" or "NASA to work on fixing air traffic delays" or "NASA to focus more on our favorite planet: Earth". Why? Well for one thing my understanding is this decision was made in the White House office of Science and Technology Policy office - and was very closely held until the weekend before the budget rollout. They were reluctant to tell the kids I guess. Even so, everyone in the Space Cadet Nation knew Constellation was a dead man walking. But denial is a powerful thing and so NASA was caught flatfooted - with no strategic plan on how to explain the nuance of this story. And let's face it the mainstream media doesn't have a clue either. Reporters who know some things about this beat have been unceremoniously dumped by the big papers and networks right and left - and many of them are now...well...webcasting. So it is the perfect storm: the agency is not sold on the change...the communications plan is non existent...the reporters are not well informed...and the public is disengaged." Keith's note: Hmmm .. the person responsible for all of this messaging is NASA PAO AA (and self-proclaimed "White House Liaison for space") Morrie Goodman who said last week: "I need to make sure that the agency's message is heard loud and clear and that our position is well known, well articulated, in the best way possible for people to understand and hopefuly come to the same conclusions that we do about the things that we do and where we are going." Does NASA Have TWO White House Liaisons? By Keith Cowing on February 24, 2010 6:30 PM. "As announced previously, the Office of Strategic Communications will be disbanded. ... Office of Public Affairs: This organization will be renamed the Office of Communications and will be led by an Associate Administrator. The Associate Administrator for the Office of Communications will report to the Office of the Administrator and will also serve as NASA Press Secretary (also see "Changes in Center Reporting")..."
"I have three goals. Number one is I need to make sure that the agency's message is heard loud and clear and that our position is well known, well articulated, in the best way possible for people to understand and hopefuly come to the same conclusions that we do about the things that we do and where we are going. The other job that I have is to be - I am the White House liaison for space. Uh, uh, um, In that fashion I have to articulate not only NASA's view but - you know, it is NASA's view - because what the President decides for NASA is what NASA does - basically." "I am the White House liaison for space"? Hmm. I thought David Noble was the White House Liaison. It even says so here at NASA.gov. Goodman is the guy who is supposed to do all of NASA's messaging "loud and clear", so what he said must be accurate, right? Continue reading Does NASA Have TWO White House Liaisons?. By Keith Cowing on February 24, 2010 6:00 PM. By Keith Cowing on February 24, 2010 5:45 PM. "It was for that reason, I guess, that I was so surprised at how you've treated a lot of the people who work for you, all of whom also love our country and spaceflight. Maybe you weren't aware that many of those people were pulling 80-hour weeks doing everything they could do move the Constellation moon program forward. The impersonal manner in which you informed them that their work was no longer needed was not good, Charlie. Nor was the fact you allowed the program that defined NASA's future to be closed down with nothing concrete to take its place. I mean, a good manager would never allow a thing like that to happen. That's why I think you were as surprised as everybody else when you got your orders from the White House. At least, I hope you were." "Commercial space pioneer Burt Rutan has sharply criticized Obama administration proposals to outsource key portions of NASA's manned space program to private firms. The White House wants NASA to use outside firms to develop and operate new rockets and spacecraft that would transport astronauts into orbit and beyond, functions that had previously been considered a core function of the agency. Mr. Rutan, a veteran aerospace designer and entrepreneur, in a letter addressed to lawmakers on Capitol Hill, says he is "fearful that the commercial guys will fail" to deliver on the promises to get beyond low earth orbit, and that the policy risks setting back the nation's space program." "Some complain that the plan concedes the moon to the Chinese. This is nonsense. The United States landed on the moon six times more than 40 years ago. As Buzz Aldrin, the second man on the moon, has pointed out, it is far more logical to partner with the Chinese on the exceedingly expensive trip to the moon. In the meantime, many of us have identified the "flexible path" as a way of moving human exploration ever more deeply into space beyond low-Earth orbit, while keeping Mars as the ultimate goal." "Like other NASA astronauts and scientists working on the complex Constellation program, Andy Thomas was surprised when the White House chose to dump the entire project. "Many of us who'd been working in Constellation and watching Constellation had recognised that some elements were not going in the right direction," he said. "We were not surprised when they were cancelled, we were surprised when the entire program was cancelled and done so without a clear plan of what the going forward position was. The wording was rather vague." By Keith Cowing on February 24, 2010 2:30 PM. Keith's note: The Senate Committee on Commerce, Science, and Transportation's Science and Space Subcommittee will hold a hearing onChallenges and Opportunities in the NASA FY 2011 Budget Proposal today starting at 2:30 pm EST. NASA will be broadcasting and webcasting this hearing on NASA TV - Watch. You can follow things on Twitter here. By Keith Cowing on February 24, 2010 7:25 AM. "NASA field center directors and mission directorate chiefs will report directly to NASA Administrator Charles Bolden under organizational changes Bolden announced Feb. 23 in a memo to senior agency officials. The heads of NASA's 10 regional field centers and four headquarters-based mission directorates currently report to NASA Associate Administrator Chris Scolese, the agency's third-highest-ranking official. That reporting structure was put in place by Bolden's predecessor, Mike Griffin." "Associate Administrator: The Associate Administrator will continue to be responsible for integrating the technical and programmatic elements ofthe Agency. However, Center Directors and Mission Directorate Associate Administrators will report directly to the Administrator rather than through the Associate Administrator. No other changes are being made in the Office of the Administrator." By Keith Cowing on February 23, 2010 10:33 PM. "NASA Administrator Charles Bolden bluntly told Congress in a letter sent Friday that the agency has kept within the law as it prepares to dismantle the Constellation moon rocket program -- despite accusations to the contrary from nearly 30 U.S. House members. The three-page letter was in response to warning sent by the lawmakers on Feb. 12 that reminded the new NASA chief that he could not shut down Constellation this year without prior approval from Congress. They said NASA has begun pulling the plug in violation of a law passed last year." By Keith Cowing on February 23, 2010 10:25 PM. "Welcome to the NASA Lunar Electric Rover (LER) Simulator. You don't need a driver's license, but you still need to buckle up as the LER Simulator gives you a glimpse of what it might be like to support the activities of a functioning Lunar Outpost. Get busy. You never know if your skills here will become a major part of the NASA Astronaut application process in the future." Download at the iTunes store. By Keith Cowing on February 23, 2010 6:10 PM. By Keith Cowing on February 23, 2010 6:03 PM. By Keith Cowing on February 23, 2010 4:45 PM. "In a piece titled "Commercial Spaceflight: Creating 21st Century Jobs" in The Huffington Post, Governor Richardson states, "I am pleased that President Obama and NASA chief Charlie Bolden have decided to promote commercial spaceflight -- let's get to work building this growing industry! The Wright Brothers would be proud." The article can be found here." "President Obama's call last month for fundamental changes in the mission of the National Aeronautics and Space Administration seemed to open the door, or roof, ever wider to private industry. Some people here interpreted his words to mean that your seat back and tray table should be in their full upright positions, because commercial space travel is about to blast off. And this flat, deserted, mostly rain-free stretch of New Mexico is the perfect location, says Will Whitehorn, the president of Virgin Galactic, the spaceport's anchor tenant. "It is about the closest you get on planet Earth to a Martian landscape," he says." By Keith Cowing on February 23, 2010 2:54 PM. "In storage at Marshall Spaceflight Center, and elsewhere around the country are spacecraft components from which we can build a true spaceship, one worthy of the name. I've called the Exploration Module, or XM. This vehicle, lifted up to orbit aboard the Space Shuttle in its final missions, would be a true spacecraft that lives only in space. ... My concept for a cycling spaceship, now universally called the Aldrin cycler, could be fashioned out of the XM. All we'd need would be a rocket to attach to it, maybe like the Centaur liquid hydrogen upper stage flown many times aboard many different launchers - and managed by Ohio's Glenn Research Center." "Former NASA associate administrator Alan Stern said he's waiting to hear what NASA officials outline in the Capitol Hill hearings, but he too has concerns about not having a precise destination. "We need a destination and a timetable and that's really lacking," Stern said. He said that relying on technology to dictate a location "sounds like a program to nowhere." Because human spaceflight is about inspiration, science and international cooperation, Stern said, "you need a specific destination, a proper noun, something that's capitalized." By Keith Cowing on February 23, 2010 2:24 PM. The NASTAR Suborbital Scientist Training Program provides space flight physiology training for prospective 'Suborbital Scientist-Astronauts' interested in understanding how to take advantage of emerging low-cost, frequent suborbital 'human-in-the-loop' experiments and Research & Education Mission (REM) opportunities. Continue reading Video: First Suborbital Scientist Class Trains at NASTAR Center. NASA and the future of space exploration: what do YOU think? By Keith Cowing on February 23, 2010 9:45 AM. "Veteran space journalist and NASA Advisory Council member Miles O'Brien will testify on Capitol Hill Wednesday, Feb. 24, regarding what the public thinks of President Obama's space plan and NASA in general. What do you think? We appreciate your participation in this short survey. Thank you." Go here to participate in the survey. Keith's note: If you'd like to suggest some comments for Miles, post them here. Brevity is encouraged. Keith's update: Expected to testify are Miles O'Brien, Hoot Gibson, Mike Snyder, Tom Young - and Charlie Bolden. By Keith Cowing on February 23, 2010 9:40 AM. "A uniquely American vision of a bold space program can be supported by Democrats and Republicans, liberals and conservatives. It would inspire the public and provide numerous technological and engineering spin-offs, while demonstrating to the world that the U.S. remains an optimistic and courageous leader. Congress should firmly reject President Obama's belly-gazing approach to the future and the next frontier by reaffirming the U.S. commitment to manned spaceflight and colonization, set dates for a manned mission to Mars, and boost NASA's budget with these goals in mind." "I believe that we will develop something better in the future," [Harry Reed, ATK Shuttle Program Manager] said. "But at this point in time I don't believe there's another product that delivers more, that is safer and more reliable than what we have to offer." The fight in Congress over the space program is just getting started." "Former U.S. Sen. Harrison "Jack" Schmitt, an Apollo 17 astronaut and friend of Taylor's who spoke at UT in November 2008, has chaired NASA's Advisory Council. He is much more blunt than Taylor in his criticism of Obama: "The administration finally has announced its formal retreat on American space policy after a year of morale-destroying clouds of uncertainty. The administration does not understand, or want to acknowledge, the essential role space plays in the future of the United States." By Keith Cowing on February 22, 2010 4:33 PM. "Unfortunately, the Orion Project suffered a failure on one of its tests this week, when a boilerplate Orion crashed to Earth after its "parachutes failed to deploy". However, the problem is not believed to be Orion or the parachute system's fault, with the failure memo citing a problem with the rigging associated with the extraction system - although this is yet to be confirmed, as an investigation will be required. "A quick heads up that the Orion test drop failed. Looks like the extraction system failed to release so the Orion chute system never deployed," noted the memo acquired on Tuesday (the day of the failure) by L2. "Still saving the remains but expecting minimal hardware recovery."" Keith's 15 Feb note: I cannot find any mention whatsoever of this crash at NASA.gov - not at the main exploration page, at the main Constellation page, at the Constellation blog or anywhere else. Why is ESMD PAO refusing to officialy explain what happened? This is not the first time that ESMD has sat on Orion parachute failure information. Keith's 22 Feb update: Still nothing from ESMD PAO on this. Either they do not want to say anything or they do not know what to say. Probably both. By Keith Cowing on February 22, 2010 11:18 AM. "NASA published its Fiscal Year 2011 Budget Estimates on Monday, providing more information about the president's plan for the agency's future. The material highlights spending plans for program elements for each of the agency's mission directorates, further defining the budget request unveiled Feb. 1. The information provides significant additional detail on the new programs, their goals, and the rationales for NASA's new direction in human space exploration." In The End Its Only About Jobs, Right? By Keith Cowing on February 22, 2010 10:08 AM. "Our real concern is Main Street: the guys who are going to see a reduction in their sales because household incomes are going to change. "We've been researching the opportunities and trying to find models of other communities around the country who have gone through similar instances. . . "
"Current and laid-off workers and promoters of ATK Space Systems say they are discouraged by an apparent drift in U.S. plans for space travel. Clearfield-based ATK Space Systems has laid off 970 workers in Utah since October, citing an uncertain future with the phase-out of the space shuttle and the Minuteman III ballistic missile programs." By Keith Cowing on February 22, 2010 10:03 AM. "Earlier this week, Sen. Barbara Mikulski of Maryland sent a two-page letter to Sen. Bill Nelson of Florida that attempts to outline her vision for NASA and notes that it is "more important than ever" that the two lawmakers "work on consultation" to consider the White House plan. The potential alliance is crucial as Mikulski heads the Senate spending subcommittee with oversight of NASA's budget and Nelson oversees the subcommittee that helps define NASA policy. "I thought it might also be helpful to share with you the principles that I will rely on when drafting the fiscal year 2011 funding bill for NASA," she writes." "The White House made two errors when announcing its plans for NASA, Sen. Bill Nelson said Tuesday. "I think they made two tactical mistakes that gave everybody the wrong impression," the Florida Democrat said. "The first one is that the president didn't set what the goal is, and everybody knows the goal and that's to go to Mars. "The second mistake was that they said they are canceling the Constellation program." "Nelson is right that space research is not a waste. It has produced useful spinoffs, including communication and weather satellites, GPS and medical advances, including Lasik surgery. But those successes don't make Obama wrong to try to unleash the inventiveness of U.S. profit-motivated entrepreneurs to build faster and cheaper ships. Jobs will be created, but they will be different jobs, possibly in different places." By Keith Cowing on February 22, 2010 9:44 AM. "I was driving by & saw this sign @ one of the busiest intersections in Houston! This photo was taken at the Intersection of Hwy 6 & 59. Kesha Rodgers is running for Congress, I guess & had this sign made up & I stopped to take a photo! She asked to Impeach Obama & Save NASA!" Hesitation or Common Sense From Inside JSC? By Keith Cowing on February 22, 2010 9:41 AM. "Therefore for me it is not a question of how do we handoff the responsibility of access to Low Earth Orbit to commercial space but how do we ensure that the commercial space community reaches a speed close to what NASA has obtained over the past 50 years so that NASA can push them off to continue the race? How do we set up the transition so that in the event that commercial space should fall, NASA can tag the fallen and temporarily continue the race? Yes I know, with the completion of the Shuttle program the push off is more of a challenge yet not impossible." By Keith Cowing on February 21, 2010 10:25 PM. According to NASA: "Space shuttle Endeavour landed at Kennedy Space Center. A post-landing news conference with managers at Kennedy is expected no earlier than midnight ET on NASA TV and www.nasa.gov/ntv. The participants will be: Mike Moses, space shuttle launch integration manager, and Mike Leinbach, shuttle launch director. A welcome ceremony for the crew's return to Houston will be held at Ellington Field's NASA Hangar 990 at 4 p.m. CT on Monday." By Keith Cowing on February 21, 2010 9:13 PM. "SpaceX's Falcon 9 launch vehicle is now vertical at Space Launch Complex 40, Cape Canaveral. Following its mate to the transporter erector, Falcon 9 was rolled from the integration hangar to the launch pad where final checks of the pad hydraulic and pneumatic systems were completed. Falcon 9 is undergoing a checkout of the critical flight connections including fuel, liquid oxygen, and gas pressure systems." By Keith Cowing on February 21, 2010 8:57 PM. "Scientists Alan Stern and Dan Durda describe the coming era of suborbital spaceflight and how it will open up great possibilities for researchers, educators, and the public beginning later this year." By Keith Cowing on February 21, 2010 5:02 PM. "One of the most important attributes of a manned space program is its ability to inspire young people to pursue careers in science. As someone who came to power on a platform of inspiration, President Obama knows about the importance of rekindling hope. Killing NASA's storied manned space program and doing away with a timeline for space travel will snuff out much of inspiration and awe that has come to be associated with NASA's endeavors." "Rarely have we seen such an about-face on an imperative national initiative. Congressional resuscitation is virtually impossible. Who wants to work for, train for and possibly die for the Moon and Mars when our national leader isn't at your side and doesn't have your back? Perhaps Obama thinks we've done that, been there. Or maybe he's not thinking at all." "American space exploration, however, as funded by the government is essentially gone. Obama - or at least his advisors, because I'm not even sure he remembers there is a NASA -- says the future of manned space travel lies in private industry, which is funny from the man who owns General Motors. Apparently, free enterprise is best condoned when it's something you don't want." By Keith Cowing on February 21, 2010 4:10 PM. "When we conceived the idea for NSRC last summer, many people were skeptical that such a meeting would generate much interest. Honestly, some thought the research and education communities were simply not interested in suborbital science," says meeting organizer Dr. Alan Stern of Southwest Research Institute. "But people voted with their feet and came to NSRC, over 250 of them, and we heard an amazing variety of proposals to exploit the capabilities of next-gen suborbital spaceflight." By Keith Cowing on February 21, 2010 3:22 PM. "During and after the meeting, the U.S. representative whose district includes Johnson Space Center, Republican Pete Olson, vowed to fight the president's plan to dramatically alter NASA human spaceflight plans. "Congress is going to challenge this plan," Olson said." "And speaking of our best interest, Senator Shelby plans to fight for the budget of NASA. With budget cuts virtually impacting all areas of our economy, NASA has felt the pinch as well. It's an element of our community that Senator Shelby stands behind. "Mississippi and Alabama are both very involved in NASA and the future of NASA. And we're going to fight that. Senator Cochran is in position in the Appropriations Committee and so am I to fight that. We haven't given up on that yet." "Earlier this week, Sen. Barbara Mikulski of Maryland sent a two-page letter to Sen. Bill Nelson of Florida that attempts to outline her vision for NASA and notes that it is "more important than ever" that the two lawmakers "work on consultation" to consider the White House plan." "U.S. Rep. Suzanne Kosmas said a bipartisan plan is in the works in Congress that would call for extending the shuttle program another five years. The plan would require adding another $200 million to the NASA budget for 2010 and $1.5 billion to $2 billion a year starting in the 2011-12 budget year. The goal would be one to two shuttle flights a year through 2015, if it could be done safely." By Keith Cowing on February 21, 2010 11:32 AM. "So, I say to you students of Embry-Riddle, don't be afraid and please don't walk away from a career in aerospace. The nation is depending on you to pry from the tiller of space the hands of those who don't understand what its promise means. The nation is depending on you to rebuild from the wreckage that our present leaders may cause. The nation is depending on you to bring the vigor of youth to aging bureaucracies and to make them all new and bright again. This you can do, this you must do, and this old rocket boy is certain you will do. Now go forth and make me proud." By Marc Boucher on February 20, 2010 9:32 AM. "WHEN America's space agency, NASA, announced its spending plans in February, some people worried that its cancellation of the Constellation moon programme had ended any hopes of Americans returning to the Earth's rocky satellite. The next footprints on the lunar regolith were therefore thought likely to be Chinese. Now, though, the private sector is arguing that the new spending plan actually makes it more likely America will return to the moon." By Keith Cowing on February 19, 2010 10:55 AM. "There are lots of changes coming to NASA during the next couple of years. The agency is retiring the space shuttle and taking its manned missions in a new direction. NASA is also struggling with the fact that the International Space Station is almost complete -- but grossly underutilized. GAO recently looked at what NASA is facing, and wrote a report with a number of recommendations." By Keith Cowing on February 19, 2010 10:17 AM. "Inspired by NASA's Constellation Program, iRover is a fun way to tour the Lunar surface and see some of the elements that make up NASA's Lunar architecture. Description: Drive your Lunar Electric Rover (LER) over the Lunar surface to conduct missions. Rescue stranded crew members, transport crewmembers, and launch and recover other Landers. Avoid being caught on the surface unprotected during Solar Particle Events (SPEs)." By Keith Cowing on February 19, 2010 9:42 AM. "Alabama's senior senator said the Obama administration is on pace to turn a $10 trillion deficit into $20 trillion during a speech before the Trussville Area Chamber of Commerce. Shelby, R-Tuscaloosa, reminded the audience he led the charge against federal bank and automaker bailouts. Shelby warned federal entitlements and deficit spending will ultimately hurt the nation's economy. During the question and answer portion of the speech, the four-term senator said he will fight to keep funding for NASA's Constellation program that the Obama administration has cut in its proposed 2011 budget. Huntsville is home to the project that Shelby helped save $600 million for last year." By Keith Cowing on February 19, 2010 8:52 AM. "A ribbon-cutting ceremony with Endeavour commander George Zamka and station commander Jeff Williams to celebrate the arrival of Tranquility and its seven-windowed cupola on the International Space Station includes the placement on permanent display in the node of a rock brought back from the moon's Tranquility Base by Apollo 11 astronauts Neil Armstrong and Buzz Aldrin in 1969, and carried by shuttle astronaut Scott Parazynski to the summit of Mt. Everest in 2009." By Keith Cowing on February 18, 2010 5:00 PM. Keith's note: I am at the Next-Generation Suborbital Researchers Conference in Boulder. My plan is to stream several portions of today's event live via USTREAMTV. First, between 8:30 and 10:00 am MST, will be keynotes by Lori Garver, Pete Worden, Alan Stern, and George Nield. Then, at 12:00 pm MST, there will be a press conference with Alan Stern, Pete Worden, Jeff Greason and a representative from Virgin Galactic. The webcast will be available here. You can follow tweets from the meeting here on Twitter. Marc's update: SwRI Announces Pioneering Program to Fly Next-Generation Suborbital Experiments with Crew - "The Southwest Research Institute announces a new initiative to build and fly experiments with SwRI payload specialists on next-generation suborbital vehicles. The program, supported with a $1 million allocation from SwRI, will be led by Dr. Alan Stern, associate vice president of the SwRI Space Science and Engineering Division. It is the first program of its kind in the nation." Keith's update: This morning, NASA Deputy Administrator Lori Garver announced that the agency will propose $15 million/year for 5 years for the CRuSR (Commercial Reusable Suborbital Research) program - that's $75 million over the course of 5 years. By Keith Cowing on February 17, 2010 6:33 PM. "While it is great that the President is reaching out to those astronauts working on the International Space Station today, phone calls do not make up for the President's disappointing decision to end NASA's Constellation program. By cutting this program, President Obama is putting an end to significant investment in moon exploration and costing Florida's Space Coast thousands of jobs." "Congresswoman Kosmas has worked tirelessly to support the space industry in Florida. She recently responded to the President's FY 2011 budget proposal calling his plan for NASA "simply unacceptable." "I think they made two tactical mistakes that gave everybody the wrong impression," the Florida Democrat said. "The first one is that the president didn't set what the goal is, and everybody knows the goal and that's to go to Mars." By Keith Cowing on February 17, 2010 6:00 PM. Keith's note: You can watch the NASA Advisory Council's Subcommittee on Education and Public Outreach meeting today live via USTREAMTV here between 10 am and 4 pm EST. After all the abuse I heap on the agency, I am glad to see that NASA is finally getting the message. Eventually, all NAC meetings - including all NAC subcommittee meetings - need to be made available to the public like this - live and interactive. Right now these meetings are only witnessed by one or two dozen people. The presentations often take a long time to get online - if ever. Transcripts or recordings are never posted. All that emerges are meeting summaries than can take months to produce - and when they do, are bland and devoid of any meaningful content. Hardly what anyone would call "transparent". Murky at best. By Marc Boucher on February 17, 2010 5:08 PM. President Obama will speak live at 5:15 pm ET with the crew on the space station. Tune in to NASA TV to watch. By Keith Cowing on February 17, 2010 5:24 AM. "Charles Krauthammer was badly off target in his Feb. 12 op-ed, "Closing the new frontier," on the Obama administration's plans for the U.S. space program. As the blue-ribbon Augustine Committee concluded last year, the Bush plan, not the Obama plan, would have left the United States a loser in space. Despite valiant efforts by NASA and its contractors, President George W. Bush's Constellation program would not have been able to send astronauts to the international space station until two years after the station had crashed into the ocean." By Keith Cowing on February 16, 2010 8:28 PM. "Add organized labor to the voices angry at President Barack Obama's decision to scrap NASA's moon program. In a letter sent to Obama on Feb. 4, R. Thomas Buffenbarger, international president of the International Association of Machinists and Aerospace Workers, said the White House idea to outsource flying astronauts into low Earth orbit would cost jobs, not create them." "The date, time and venue for the rally have been set (Saturday, February 27th at BCC North Campus, Titusville, 3:00 p.m.). National AFL-CIO President Rich Trumka, presidents of national and international unions, Florida AFL-CIO President Mike Williams, elected officials and perhaps some celebrity guests will speak. However, this is not a union rally. This is a community event intended to protect local business, our schools and the quality of life we presently enjoy." "Although for the thousands of dedicated employees who have been working diligently on Constellation, there will naturally be disappointment and concern, in the end, the Administration has chosen a more realistic and pragmatic path towards a more sustainable and ultimately successful overall mission." By Keith Cowing on February 16, 2010 5:31 PM. "NASA Administrator Charlie Bolden said Tuesday that President Barack Obama has asked him to "find ways to reach out to dominantly Muslim countries" as the White House pushes the space agency to become a tool of international diplomacy. "In addition to the nations that most of you usually hear about when you think about the International Space Station, we now have expanded our efforts to reach out to non-traditional partners," said Bolden, speaking to a lecture hall of young engineering students." "Why bother with human spaceflight at all? For many people and countries, human spaceflight represents a pinnacle of human technological achievement and prestige. Others point to potential economic and environmental benefits that could come from activities ranging from space tourism and tapping resources on the moon to use as fuel for fusion energy to mining asteroids or producing pharmaceuticals in microgravity conditions." By Keith Cowing on February 16, 2010 9:49 AM. "This change of plans clearly breaks Obama's promise to "endorse the goal of sending human missions to the Moon by 2020, as a precursor in an orderly progression to missions to more distant destinations, including Mars." But the president's budget for NASA does keep five other campaign promises. It proposes working with international allies to extend the life of the International Space Station at least through 2020; it supports access to space for private-sector companies; it supports increased investment in research and development related to space; it supports increased spending to prepare for longer space missions; and it establishes school programs to highlight space and science achievements." By Keith Cowing on February 15, 2010 10:40 PM. "I mean no disrespect - but - I am tired of listening to Dr. Spudis, Dr. Griffin and all of the other, whiney, Baby Boomer, Cold Warrior, Manifest Destiny driven individuals who are still trying to live out their 1950's childhood dreams - at taxpayer expense. Like many of you, for the past 25 years, I have played my own minor role in a vibrant NASA. I have watched as NASA has pushed back the limits of robotic exploration of the solar system with ever more complex and capable probes. In addition, I have seen NASA greatly expanded our view of the Earth - helping us better understand how our environment is changing and how human activities and natural processes contribute to that change. In contrast, human spaceflight has, just during my career, driven off a cliff." By Keith Cowing on February 15, 2010 9:39 PM. "Former Rep. Nick Lampson, D-Stafford, who had been in line to lead the House panel overseeing NASA before losing his seat to Olson, blames Texas' current predicament squarely on the sweeping congressional redistricting fashioned by then-House Majority Leader Tom DeLay, R-Sugar Land. "Texas has suffered greatly," said Lampson, who lost races in two congressional districts as a result. "Without that redistricting, I would have been chairman of the space subcommittee representing JSC and in direct contact with the president and House leadership. That would have made a difference." "While NASA workers are legitimately concerned, there are signs that Decatur could enjoy some benefits in the midst of the hardship of a scaled-down Marshall. The most obvious is the potential growth of United Launch Alliance in Decatur. After massive effort, ULA's Decatur plant will soon be the sole assembly plant for three of the most reliable rockets in the United States: the Delta II, the Delta IV and, most recently, the Atlas V."
"President Obama's proposed federal budget for fiscal year 2011 delivered both good and bad news for space- and NASA-related organizations in Hampton Roads such as NASA Langley, NASA's Wallops Flight Facility and the Mid-Atlantic Regional Spaceport." "Key areas of expertise at NASA Ames that are a priority in the new NASA budget include international partnerships, information technology, space science, earth science, small satellites and exploration technologies, Braxton said. NASA Ames employs 1,250 civil servants and 1,250 contractors, but Braxton believes that number may soon increase, and the agency's new direction could be a boon to local employment, not just for NASA but for companies partnering with NASA in Silicon Valley." By Keith Cowing on February 15, 2010 6:09 PM. "SpaceX doesn't "fully understand the dramatic difference between a crew launcher and a payload launcher," Dr. Fragola said. For example, the capsule designers have to carefully study the conditions following an accident, including the blast heat, fragments of the disintegrating booster and the pressure wave of an explosion. While they do not matter for cargo, "the crew cares tremendously about what the conditions are, because it relates to their survivability," Dr. Fragola said." "With regard to Jeff Hanley's current comments, this is not the first time that Hanley's organization has had problems presenting (or admitting) a consistent view of what Ares 1's safety was relative to Shuttle and other launch systems. Indeed, you only have to look at Joseph Fragola's presentation to the Augustine Committee to see what Constellation knew Vs what it said. Specifically, there was a briefing chart that was withheld from the Augustine Committee - see below for that chart." 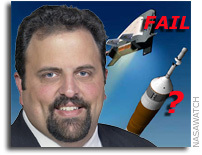 Keith's note: I find it the height of hypocrisy for Joe Fragola to make these statement that SpaceX "doesn't fully understand" human rated launch vehicles when Fragola himself was incapable of accurately presenting the true safety numbers for Ares 1 to the Augustine Committee. Why should anyone take anything he says seriously? By Keith Cowing on February 15, 2010 1:19 PM. "In the 1968 film, "2001: A Space Odyssey," astronauts shuttled from the Earth to an orbiting space station aboard a commercial space plane and private firms carried out many other functions in low-Earth orbit, including the Hilton hotel on the station. Flash forward to 2018, and imagine NASA astronauts boarding a commercial space launcher delivering crews to the International Space Station. This may become reality for space exploration if Congress accepts the recently announced Obama administration's approach. This new direction proposes a major shift in the way NASA accomplishes human spaceflight." By Keith Cowing on February 15, 2010 10:00 AM. "The unilateral decisions by the Administration are likely in direct violation of the Impoundment Control Act," Posey said." "The purpose of this letter is to notify offerors of the Exploration Ground Launch Services (EGLS) Request for Proposal (RFP) cancellation. Solicitation Number NNK09275664R Amendment 005, which cancels the solicitation, is attached. In light of recent events and the uncertainty of future ground processing requirements for fiscal year 2011 and beyond, it is in NASA's best interest to cancel the current solicitation. A procurement strategy for future program ground operations requirements will be developed as such requirements are identified." "We are compelled to remind you that setting aside funds may be a direct violation of the Impoundment control Act (as well as of the appropriations language for FYlO). That act resulted from the refusal of the Nixon Administration to allot funds to activities specified by Congress. According to GAO, the Act was also used to confirm Congressional authority at least twice during the Administration of President George W. Bush." By Ian Malone on February 15, 2010 8:45 AM. One of the premier space exploration advocacy groups is the National Space Society, (NSS). Formed in 1987, the NSS has established chapters across the country and around the globe. For much of its history the NSS has been a powerful force promoting manned spaceflight. However, much like NASA's Public Affairs Office, the NSS has lost touch with the people it is supposed to represent. The NSS's upper echelons until recently were massively instrumental in guiding the future of manned spaceflight. Continue reading NSS at Crossroads?. By Keith Cowing on February 14, 2010 10:21 PM. "... the Commission found that NASA simply can not accomplish the goals with which it has been tasked unless it receives an additional $3 billion in annual funding. In the current economic climate, however, it is uncertain which path our nation's leaders will now take in response to the Augustine Commission's findings. An increase in funding is not necessarily the path that will be chosen." Keith's note: Gee folks, your "blitz" is a little more than a week away. It might be a good idea to update your website to reflect the actual situation NASA is in. By Keith Cowing on February 14, 2010 10:12 PM. Keith's note: Some new images were posted at nasa.gov tonight. Have a look this image. Specifically, look at the direction labels inside of Node 3 ("Tranquility") that have been covered up (partially). On the right hand side of the image you can see an arrow that says "-> to HAB". On the left hand side you can see directions "<- to CRV". "CRV" usually means "Crew Rescue (or Return) Vehicle". "HAB" refers to the habitation module. Both of these things were deleted from the ISS program many years ago. By Keith Cowing on February 13, 2010 8:40 PM. "The U.S. Defense Department may have created the Internet, but had it kept control of the technology, it's unlikely the Web would have become the vibrant public resource it is today. That credit goes to the investment and activity of private citizens and private companies, starting in the late 1980s and early 1990s. With Barack Obama's new spending proposals, the same sort of thing could happen to space travel and exploration." "Government agencies have dominated space exploration for three decades. But in a new plan unveiled in President Barack Obama's 2011 budget earlier this month, a new player has taken center stage: American capitalism and entrepreneurship. The plan lays the foundation for the future Google, Cisco and Apple of space to be born, drive job creation and open the cosmos for the rest of us." By Keith Cowing on February 13, 2010 2:35 PM. "The shuttle Endeavour delivers "windows on the world" to the International Space Station, aftershocks from the Obama Administration's budget bombshell rattle NASA, prospects for a shuttle program extension - while remote - live on, the Solar Dynamics Observatory soaks up the sun, SpaceX gets ready to light the candle on Falcon 9, and Hubble/ESA/the European Southern Observatory wow us with some new out-of-this-world pictures." By Keith Cowing on February 13, 2010 1:00 PM. "NASA will soon be spending more than a billion dollars per year to back-up our part in these commercial partnerships. We will be providing industry with NASA technical expertise, to help with the practical technical problems, as well as to make these vehicles safe enough for NASA astronauts to fly on. We will provide serious seed money on the investment side and a firm commitment to buy crew transportation services on the market side. We will diversify our risk by funding a portfolio of highly-qualified competitors. Instead of a highly-risky approach, in which we fund only one system, we are going to fund many systems to create redundancy. No single commercial system will represent the critical path. We are going to see the most exciting race that America has seen in a long time, and there is likely to be more than one winner." "I wasn't born here at JSC, but I got here as soon as I could"
By Keith Cowing on February 13, 2010 1:28 AM. In this day and age, should I have pointed over his shoulder and said... That flag up there on that roof flies every day there are Americans on orbit. It has been there continuously, longer than I've been working here. If you go through those doors across the parking lot and turn left and could get past the locked doors and guards, you would be in Mission Control. THE Mission Control Houston. You could pick up a mic and talk to the astronauts and cosmonauts working in space right now. If you turn right instead, you'd find a building full of mission operations people who a week ago had no question that their contributions were valued by the country. Today, I don't know how that question would be answered in that building. I'm angry the question has even come up. I wasn't born here at JSC, but I got here as soon as I could. I just don't know whether here is supposed to be 'where it all happens' anymore." By Keith Cowing on February 13, 2010 12:19 AM. "In 2008 the Lunar Orbiter Image Recovery Project (LOIRP) began a NASA ESMD sponsored project to resurrect 43+ year old Ampex FR-900 instrumentation tape drives for the purpose of recovering, before the capability to do so becomes impossible, the last surviving master tapes from the five Lunar Orbiter spaceraft that orbited the Moon in support of Apollo in 1966-67. Our project is proceeding on our task to do so. During our research on the Ampex tape drives we scoured the NASA Technical Reports Server as well as any other source we could get our hands on. One of the things that the LOIRP team is going to do is to take the Nimbus II HRIR data from August 23rd 1966 and overlay that with the Lunar Orbiter 1 data on the same date for a composite mosaic. There is potential for a significant synergy between Lunar Orbiter, Apollo, and Nimbus II and III data sets. This type of synergy could provide many benefits to the Earth sciences community." "Starting with the methods developed for the Lunar Orbiter Image Recovery Project (LOIRP) at NASA Ames Research Park, a team at NSIDC worked with Dennis Wingo at LOIRP to search NASA archives for the original Nimbus tapes containing raw images and calibrations. Their first goal was to read and reprocess the data at a higher resolution, removing errors resulting from the limits of the original processing." By Keith Cowing on February 12, 2010 10:02 PM. "The private sector simply is not up for the job. For one, NASA will have to establish a system to certify commercial orbital vehicles as safe for human transport, and with government bureaucracy, that will take years. Never mind the challenges of obtaining insurance. Entrepreneurial companies have consistently overpromised and under-delivered. Over the past 30 years, over a dozen start-ups have tried to break into the launch business. The only one to make the transition into a respectably sized space company is Orbital Sciences of Dulles, Va. Building vehicles capable of going into orbit is not for the fainthearted or the undercapitalized." Keith's note: When chronic Obama critics Newt Gingrich and Bob Walker make a point of saying that there is value in President Obama's space plan, I sit up and take notice. Then again, these are both interesting guys who often think outside the box, so this is not all that surprising. I continue to be fascinated by how this new policy has parsed the space community with equal numbers of liberals, conservatives, Republicans, Democrats, politicians, and business representatives on either side of the argument. On the other hand I am startled at how so many self-described experts in space commerce such as Taylor Dinnerman (whose supposed website SpaceEquity.com is now used for credit repair links) have such a woefully thin level of confidence in the ability of the private sector to innovate and succeed. I guess he missed these Falcon 9 launch preparation pictures the SpaceX posted yesterday. Certainly looks "respectable" to me. I guess this is a classic case of "where you stand depends on where you sit". I think it also shows that faith (or lack thereof) in the private sector is not the exclusive property of any one party or faction. Fascinating. I sense precursors to a paradigm shift in the making. "In the op-ed, Gingrich and Walker state, "Bipartisan cooperation has been difficult to achieve in Congress, but here is a chance. By looking forward, NASA has given us a way to move forward. It deserves broad support for daring to challenge the status quo." By Keith Cowing on February 12, 2010 9:30 PM. By Keith Cowing on February 12, 2010 8:42 PM. "This is not money-saving. This is having some kind of half-baked scheme that we can commercialize this," said Bishop, whose district is home to ATK Space Systems, the Magna, Utah-based solid-rocket motor manufacturer that is building the first stage of Constellation's Ares 1 rocket and major subsystems for its launch abort system. ATK executives told investors Feb. 4 that canceling Ares 1 would cost the company $650 million in contract backlog." By Keith Cowing on February 12, 2010 2:02 PM. "A group of North Alabama leaders concerned over proposed White House changes to Marshall Space Flight Center-managed rocket programs have come together to form a task force in an effort to restore funding cuts. The "Second to None Initiative" brings together 25 community leaders, led by former Huntsville U.S. Rep. Bud Cramer, to fight the Obama White House proposal that would shift NASA's focus from returning to the moon to technology development and seeding small, private space companies." "The "Second to None Initiative" will include the following community leaders: Bud Cramer - Task Force Chairman, Joe Alexander - Camber Corporation, Rose Allen - Booz, Allen, Hamilton, Bruce Anderson - Alabama Development Office, Ed Buckbee, former director of U.S. Space & Rocket Center, Angie Calvert, Davidson Technologies, Jim Chilton, Boeing, Steve Cook, Dynetics, Tommy Dillard, ATK, Kim Doering, United Space Alliance, Mike Griffin, UAHuntsville, John Gully, SAIC, Shar Hendrick, The Hendrick Group, John Horack, UAHuntsville, Andrew Hugenie, Alabama A & M University, Dave King, Dynetics, Don Nalley, Huntsville/Madison County Chamber of Commerce, Elizabeth Newton, UAHuntsville, Ed Pruitt, Lockheed Martin, Joe Ritch, Tennessee Valley BRAC Task Force, Dennis Smith, MEI, Irma Tuder, Analytical Services, Joe Vallely, City of Huntsville, Mike Ward, Huntsville/Madison County Chamber of Commerce, Tom Young, Kord Technologies"
By Keith Cowing on February 12, 2010 12:38 AM. "But the Obama 2011 budget kills Constellation. Instead, we shall have nothing. For the first time since John Glenn flew in 1962, the United States will have no access of its own for humans into space -- and no prospect of getting there in the foreseeable future." Keith's note: Um, check your facts next time. First: America did indeed have the ability to launch people on Mercury-Atlas missions after John Glenn flew - and those missions were launched. Second: there was a 6 year gap between Apollo-Soyuz in 1975 and STS-1 in 1981. We had no way to send humans into space during that time. And, FWIW, between the end of Mercury and the beginning of Gemini, we had no access, and between Gemini 12 and Apollo 7 we had no access to space. Between STS-107 and STS-114 ... and so on. Gaps are not a new thing. By Keith Cowing on February 12, 2010 12:08 AM. "Here's a teaser for the weekend. This is flight 3 from our testing today looking up from the edge of the launching pad. The flight is a boosted hop to 68 meters (our current FAA waiver is 76 meters for now). This is our 7th free flight of XA-0.1-B, Xombie and our first since our Northrop-Grumman Lunar Lander Challenge level 1 win in October of 2009. Testing went very well for the day and Xombie is performing admirably. More video after the Presidents' day weekend. Visit www.masten-space.com for more information." The Onion: NASA's First Flexible Path Mission? By Keith Cowing on February 11, 2010 10:49 PM. By Keith Cowing on February 11, 2010 9:50 PM. Keith's note: According to Lori Garver's comments at today's FAA commerical space meeting, NASA DFRC will now take the lead on flightworthiness evaluations for suborbital vehicles that will fly NASA crew or payloads. This is somewhat of a shift from what people might have otherwise expected given that COTS and CCDev were being handled out of JSC - and that crew issues have always been the province of JSC. DFRC is where X vehicle work has been done for decades. Is NASA now going to treat commercial vehicles like X-vehicles? Stay tuned. By Keith Cowing on February 11, 2010 9:46 PM. "Under Admiral Craig Steidle starting early in 2004, the VSE was a forward looking program that was open to new ideas and the development of fundamentally new, innovative technology. Griffin shut the door firmly on most of those new ideas in 2005. Instead, he looked backward at what had been stolen away from him and the space community by politics 40 years ago - a continuation of the Apollo Program, and tried to re-create it as "Apollo on Steroids". By Keith Cowing on February 11, 2010 9:02 PM. "- Associate Administrator for Public Affairs Briefing. - Discussion of Social Media Opportunities and Challenges. - Associate Administrator for Education Briefing. - Discussion of Opportunities and Challenges to Reach K-12 Students. - Discussion of how to Organize the Committee Work Plan." Keith's note: All of these NAC committee and subcommittee meetings are almost always held in a windowless conference room inside NASA HQ. If you can get to them then you can sit and listen - if you happen to read the Federal Register or NASA Watch and even know that they are happening. Otherwise, you are out of luck since NASA never records them for later viewing by taxpayers. Given the tremendous changes that have been proposed for the agency, employees and the public have a vested interest in these discussions - now more than at any time in recent years. The NASA people who supported the Augustine Committee's activities set a new standard for how social media can be used to relay policy information to the public. Indeed, they often had things online before the media covering these events did. There is no reason why that standard of quality should not be applied to all public meetings concerning NASA policy. Given that the Obama Administration is all about openness, transparency and all that good public participation stuff - and that this meeting is about "Education and Public Outreach" perhaps PAO AA Morrie Goodman (a scheduled speaker) can start with this subcommittee and provide a live webcast of this event on NASA's USTREAM.TV account. The webcast can be archived for later viewing. It is very easy to do. All it takes is a laptop, a webcam, and an Internet connection. 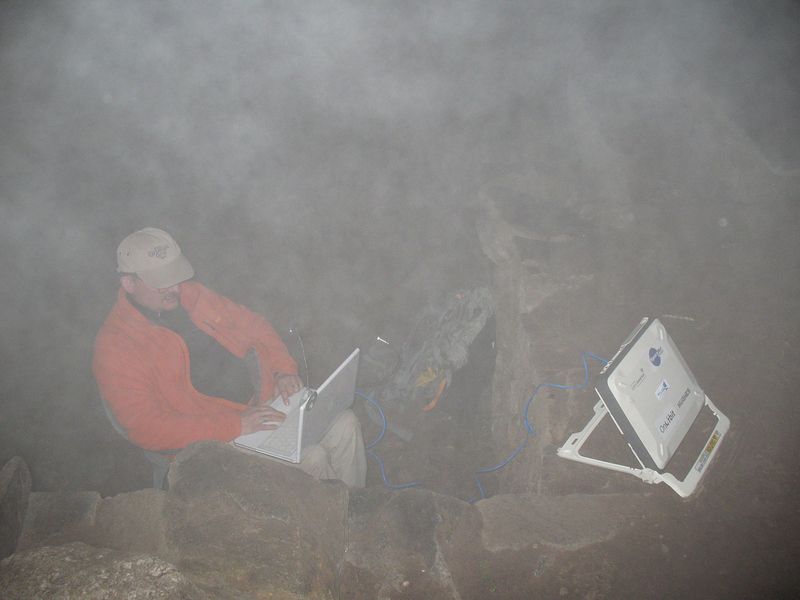 I have done these things on an EVDO modem live at Desert RATS from the middle of an Arizona desert, from the basement of Rayburn House Office Building, and from Everest Base Camp in Nepal at 17,500 feet over a satellite phone. By Keith Cowing on February 11, 2010 2:26 PM. "We expect to launch in one to three months after completing full vehicle integration," said Brian Mosdell, Director of Florida Launch Operations for SpaceX. "Our primary objective is a successful first launch and we are taking whatever time necessary to work through the data to our satisfaction before moving forward." ... Though designed from the beginning to transport crew, SpaceX's Falcon 9 launch vehicle and Dragon spacecraft will initially be used to transport cargo. Falcon 9 and Dragon were selected by NASA to resupply the International Space Station (ISS) once Shuttle retires. The $1.6B contract represents 12 flights for a minimum of 20 tons to and from the ISS with the first demonstration flights beginning in 2010." By Keith Cowing on February 11, 2010 12:44 PM. "Nearly half a century ago, President John F. Kennedy challenged America to put a man on the moon. Earlier this month, by killing NASA's Constellation program, President Obama essentially challenged the space agency to do something other than put a man back on the moon." "As a longtime NASA booster, I couldn't help but feel a gut kick when the President's new budget meant the end of Constellation, a program commonly nicknamed "Return to Flight" and "Apollo on Steroids." To many of us, Constellation offered an end to the directionless Space Shuttle era and a return to the glory years of Apollo. As a historian, though, I knew at the program's announcement six years' ago that such an epic undertaking, back to the Moon and then onto Mars, would never happen." By Keith Cowing on February 11, 2010 12:24 PM. "Critics of the Obama space plan point out that setting up private companies, like Falcon rocket-maker SpaceX, duplicates what NASA can already do and sets space exploration plans back. "I think the problem here is that the private sector doesn't really know what 'private space' means," said Steve Cook, vice president for space systems at Huntsville-based Dynetics and former Marshall Ares program manager. "Is it telecommunications? Is it launch vehicles? Is it research and science? All of those are functions and business models from established companies." Keith's note: Hey Steve - in case you haven't noticed, you are in the 'private' sector now -- so, by definition, you don't know what is going on either! By Keith Cowing on February 11, 2010 8:11 AM. Keith's note: The 13th Annual FAA Commercial Space Transportation Conference is underway despite the closure of the federal government. Kudos to FAA and the AIAA! Live tweeting of FAA AST conference is going on at #astconf and #FAAcstc. Keith's update: Charlie Bolden was originally scheduled to speak. Lori Garver will speak instead - but will be speaking at noon (not 8:00 am EST). I am not certain if NASA TV will carry Garver's speech. "Commercial space is page one above-the-fold and the President's budgetary plans are going to keep it there. You'll hear more from Administrator Bolden tomorrow, but commercial space just got a huge boost budget-wise. On another front, just yesterday there were 150 people gathered right here to learn about the FAA's center of excellence in commercial space transportation. Separately, those events are the kind of signals you look for in any business. Put them together, and you've got all the makings of a grand slam. Personally, I don't think it's going to stop there." By Keith Cowing on February 10, 2010 7:18 PM. "The extra-solar planet count is more than 400 and rising. Before long we may find an Earth-like planet around another star. If we do, and can visit, what next? Stake out our claim on an alien world or tread lightly and preserve it? We'll look at what our record on Earth says about our planet stewardship. Also, whether a massive technological fix can get us out of our climate mess. Plus, what we can learn about extreme climate from our neighbors in the solar system, Venus and Mars." By Keith Cowing on February 10, 2010 4:10 PM. "The rationale given by administration officials was viable, said Keith Cowing, a former NASA manager who for years has served as editor of the NASA Watch Web site as well as Spaceref.com. "The costs were spiraling, the rockets weren't working and the cost would have been something NASA never would have been expected to get. I was surprised they went as far as they did. ... There's something to be said for killing it completely, once and for all." What Cowing and others -- meaning just about everyone else -- have a difficult time understanding is where exactly manned exploration under NASA is headed. "Flexible is an interesting word," Cowing said. "It means you adapt, you listen, you learn. But path means there is a direction you are heading. I don't see that yet." By Keith Cowing on February 10, 2010 12:50 PM. "The decision to kill Constellation is akin to President Richard M. Nixon's decision to end the Apollo program in the early 1970s and build the space shuttle." "The National Space Society, which was once headed by NASA's current deputy administrator Lori Garver and chief of Staff George Whitesides, said in a press release today that the White House plans to increase spending on science, technology and commercial space companies to ferry astronauts for the international space station was commendable. "However, we believe the President's 2011 budget request would leave the job only partly done," the release said. "NSS calls for the President and Congress to restore funding for human spaceflight beyond low-Earth orbit." "But NASA cannot pass the baton of human spaceflight to a runner that is still trying on its shoes. The private sector requires years of further development before it can send a human being to the moon or compete with America's international rivals. NASA was assigned the Constellation mission for the same reason it took on Apollo: It remains the only entity in the country capable of getting it done." "The president's plan is not what our country needs at this time," said Rep. Pete Olson, R-Sugar Land. "We have been the world's leader for 50 years, and I can't accept that we're going to fall behind. We are going to fight, fight, fight to ensure that the next person who steps on the moon is an American." Olson said the right thing to do is add $3 billion to NASA's budget annually for the next five years to ensure Constellation is fully funded." "I've got tiger teams out there looking to put meat on the bones" to define future NASA work, Bolden told a group of reporters and editors during a meeting at The Times today. "This is not a decision that will be resolved in a day." "Davis, a candidate for governor, joined Huntsville Mayor Tommy Battle and former NASA Administrator Mike Griffin in the meeting with 20 aerospace executives from companies such as Boeing and Dynetics to discuss strategies to keep the Ares rocket and return trips to the moon in the federal budget." By Keith Cowing on February 9, 2010 6:41 PM. "NASA has signed a deal worth 306 million dollars (224 million euros) with Roskomos for six rides to the ISS in 2012 and 2013, or a charge of 51 million dollars per US astronaut. But with space now limited aboard the Soyuz rocket, Russia looks set to curb its lucrative space tourism service, for which it had charged cosmos-crazed tycoons 35 million dollars (28 million euros) for the ultimate adventure." "NASA/JSC intends to contract with Roscosmos for these services on a sole source basis for 6 Soyuz seats with associated services in CY 2013 with rescue/return services extending through spring 2014. These services are being procured through Roscosmos because the Soyuz is the only other proven crew transportation and rescue vehicle, other than the Space Shuttle which is scheduled to retire in 2010. These services are serving as a bridge between the Space Shuttle and the availability of a commercial vehicle. Until a commercial vehicle is available, continued access to Russian Crew launch, return, and rescue services is essential for planned ISS operations and utilization by all ISS partners." By Keith Cowing on February 9, 2010 3:01 PM. Keith'snote: The NASA 2010 PM Challenge is underway today and tomorrow. According to NASA: "The PM Challenge is one of NASA's premier training events. It brings together the best speakers, discussion panels, case studies, and networking opportunities in program/project management, systems engineering, safety & mission assurance, team building, business management, and many others." Participants are Twittering from inside the event. You can follow their Tweets here. By Keith Cowing on February 9, 2010 10:57 AM. "Although it is not currently popular in this country to think about national interests and the competition of nations in space, others do not labor under this restriction. Our current human spaceflight effort, the International Space Station (ISS), has shown us both the benefits and drawbacks of cooperative projects. Soon, we will not have the ability to send crew to and from the ISS. But that's not a problem; the Russians have graciously agreed to transport us - at $50 million a pop. Look for that price to rise once the Shuttle is fully retired. To understand whether there is a new space race or not, we must understand its history. Why would nations compete in space anyway? And if such competition occurs, how might it affect us? What should we have in space: Kumbaya or Starship Troopers? Or is the answer somewhere between the two?" By Keith Cowing on February 9, 2010 8:54 AM. "Coats and NASA administrator Charles Bolden met with reporters after Bolden spoke with Johnson employees in Houston. "The workers are hurting," Bolden acknowledged. Bolden said he could not say what new programs the Houston space center will attract in the wake of Constellation that may account for some of the jobs lost. "We're at the very beginning of trying to understand what this really does mean," said Bolden, himself a former astronaut. "We can't give any answers until we find out what the follow-on programs will be, and what people we can transition to them." "The Obama Administration's revised manned space program doesn't envision U.S. astronauts venturing beyond Earth's orbit until at least 2020, and perhaps years later, according to the head of the National Aeronautics and Space Administration." "I hear a lot of people saying, 'Obama kills moon program.' It's not true; the moon program was moribund. What killed the Constellation program [to return to the moon] was years of underfunding since President Bush announced it in 2004,'' said Jeffrey Hoffman, a professor at the Massachusetts Institute of Technology and former astronaut who made five space shuttle flights. "NASA is now engaged on a quick study of what really are the technologies we need to have another go at human space flight beyond the earth." "If done right, the president's strategy could pay off handsomely. If not, it could be the start of a long, slow decline from the nation's pre-eminent position as a space-faring power. We are particularly concerned that the White House has not identified a clear goal -- Mars is our choice -- or set even a notional deadline for getting there. The National Aeronautics and Space Administration and Congress need to keep the effort focused and adequately financed." By Keith Cowing on February 8, 2010 3:25 PM. "An hour after the orange glow of Endeavour's liftoff lit the Kennedy Space Center press site on Feb. 8, NASA officials beamed at the bit of bright news illuminating an otherwise tough couple of weeks. The smooth countdown for STS-130 and the relatively few technical problems -- a bit of foam loss, but nothing judged too serious -- shifted the tone of the press conference to one that joked about workers missing the Super Bowl. "While I was getting evil glares for making them come in -- I don't know why it was my fault -- they were happy with the result," said Mike Moses, the shuttle program's launch integration manager, as journalists chuckled." By Keith Cowing on February 8, 2010 3:04 PM. "NASA Administrator Charles Bolden and Johnson Space Center Director Mike Coats will be available for a roundtable discussion with media at 2:30 p.m. CST today, Monday, Feb. 8, at the Johnson Space Center. Bolden and Coats will discuss the fiscal year 2011 budget request and bold new developments in the nation's civil space effort. Media planning to attend should contact the JSC newsroom at 281-483-5111 no later than noon CST. The event will not be broadcast on NASA Television. For more information on NASA and its programs, visit: www.nasa.gov"
Keith's update: @Astro_Sugar is twittering comments from Bolden's employee event at JSC in real time here. Keith's update: These comments (Tweets) were posted by a NASA employee during (and about) an official NASA event during the course of their work day. Astro_Sugar is now protecting their Tweets but you can still read them here. Earlier in the day these Tweets were made without any protection and were reteweeted and referenced by other NASA employees during work hours. Members of the media are also among this person's followers before I made mention of them. I was asked to remove mention of this from NASA Watch but due to the public nature of these Tweets and the fact that people were readily telling others about them I decided to leave the link intact. These comments were overtly public. Those postings (Tweets) aprovide a nice snapshot of Charlie Bolden's employee interactions today at NASA JSC. By Keith Cowing on February 8, 2010 1:16 PM. "NASA officials announced today the successful launch of the new shuttle Moonage Daydream, marking the beginning of a long-anticipated two-week conceptual mission inspired by British rock star David Bowie. The crew of Moonage Daydream embark on the 4.5 billion dollar, genre-defying mission. According to NASA administrator Maj. Gen. Charles F. Bolden, Jr., the highly experimental glam space program--dubbed Project Starman--has been in development for exactly five years. Though engineers initially feared the mission might "blow our minds," the historic launch ultimately proceeded without incident." By Keith Cowing on February 8, 2010 8:29 AM. "After a one day delay due to clouds, space shuttle Endeavour launched at 3:14 a.m. CST Monday from the Kennedy Space Center in Florida with a new module and an attached cupola for the International Space Station that should increase human understanding of our home planet. It was the last scheduled night launch in shuttle program history." By Keith Cowing on February 8, 2010 7:54 AM. By Keith Cowing on February 6, 2010 9:02 PM. By Keith Cowing on February 6, 2010 8:56 PM. "Senior Chinese space officials have told their state media that China could be on the moon by 2022 at the outside. Other authoritative Chinese space engineers see a moon landing as a next step in the Tiangong program that will launch three Chinese space stations into Earth orbit between 2011 and 2015. In 2008, NASA scientists told the Bush White House that, with the technology currently available to the Chinese space program, Chinese cosmonauts could be on the moon by 2017." "The man stood watching the glowing television sets stacked in the storefront window. The window was dirty, the glass cracked and repaired with a strip of tape. A boy stood beside him. "What are you looking at, Dad?" "I'm watching the Chinese celebrate the completion of their moonlab, son. Look, there they are on the moon. See how happy they are?" "They always seem to be so happy. How come nobody around here is ever that happy, Dad?" The man looked at his son in surprise. "Well, I don't know. I guess I haven't thought much about that." By Keith Cowing on February 6, 2010 2:02 PM. "The head of Nasa, Major General Charlie Bolden, admitted last night that the task of breaking the news of Constellation's proposed cancellation to staff at the space agency's 10 centres had been badly handled. "Was it screwed up? Yes it was," he said, confessing that he had ignored advice from aides that might have made for a smoother presentation. "I didn't listen to people," he added." "A popular former astronaut, Bolden said he made a mistake by failing to brief Congress on President Barack Obama's new plan before the rollout Monday of the White House's proposed 2011 budget. "I don't fool myself that I have not injured some relationships. And so my task now is to try to go in and repair those former, incredibly good relationships because of my ineptness in rolling out this plan." "I thought I knew better, to be quite honest," he said. "So, we rolled out the budget and rolled out everything in the manner we did. Was it screwed up? Yes. So, I learned a valuable lesson." By Keith Cowing on February 6, 2010 2:00 PM. Keith's note: You know that the message plan NASA has been trying to roll out is not working when signs carried by protesters outside of KSC today say "Obama lied - NASA died". It gets worse: I also received a link to a YouTube video from someone sitting at their desk at NASA that uses captioned movie footage of an actor playing Hitler to criticise the Obama decision on Constellation. This ain't good folks. Keith's update: Oh yes - to all of you who are demanding that I post a link to the Hitler video: No way. I find even a casual comparison of anyone to Hitler under any circumstances to be reprehensible and I will not allow this website to be a party to that. If you do not like this policy, then go find another website to read. There will be no further discussion on this topic. Alas, Portal to the Universe, "the latest Cornerstone project of the International Year of Astronomy 2009 (IYA2009)" apparently thinks that Hitler jokes are funny. The posting is by "AmericaSpace" which is run by Jim Hillhouse. Using Hitler - in any context - is never funny and only serves to drag any associated discussion into the gutter. By Keith Cowing on February 5, 2010 11:24 PM. "I'm angry. It's very short sighted on the part of this administration," said Cernan. "He is somehow unwilling to invest in the future of this country and the future of this country is important to me. I won't be here 20, 30, 40 years from now, but my grandkids will. I want them to have the country I had. I want something better for them." "Many of my colleagues and peers have written articles and pieces, deriding the idea of commercial LEO access. Indeed, the track record of the self-described "New Space" companies has thus far, been marked generally with failure and arrogance. Not all, but many of these folks, before they run their companies into the ground, seem to spend the bulk of their time attending self-serving, self-aggrandizing conferences where openly slinging mud at NASA is sport. This is hardly constructive, and it brings discredit to others who have serious aspirations for the future of commercial spaceflight." "The new budget, announced Monday, seems merely an attempt to disguise the demise of U.S. leadership in space. The president does away with Constellation, its Orion spacecraft, and its Ares I and Ares V boosters. The abrupt cancellation means the U.S. no longer wishes to send its explorers to the frontiers of knowledge and spacefaring skill. We are deliberately choosing to have no better space capability than do Russia, China, or India." "Another former shuttle astronaut, Ken Bowersox, is more bullish on the commercial prospects - perhaps in part because he's now an executive at one of those companies, California-based SpaceX. Today Discovery News quoted him as saying that space contractors "should be able to come up with new and innovative ways" to fill NASA's needs for resupplying the International Space Station." "COWING: Well, it already is commercial, the funny thing is that the Russians have been taking paying passengers for the better part of a decade now. And I always find great humor in that you have a country who's got a capitalist economy that's barely been a decade and a half old and they came out of Communism, and yet they're teaching us how to commercialize space. And we've got an economy that's two and a half centuries old based on the capitalistic way of doing things. So, this isn't new, it's just it's new to America." By Keith Cowing on February 5, 2010 5:40 PM. "I have previously discussed what I perceive as the most significant problem with FP, namely, that it is activity without direction. The administration's budgetary version of this path confirms this perception. Much verbiage is thrown around about multiple missions to all sorts of destinations, blazing new trails with new technology, trips to Mars that last weeks instead of months, and "people fanning out across the inner solar system, exploring the Moon, asteroids and Mars nearly simultaneously in a steady stream of firsts." But nowhere in the budget documents or agency statements is there anything about the mission that we are undertaking. So we're going to an asteroid. What will we do there? Why are we going there? What benefit accrues from it?" "But the 2,000 jobs the administration expects private companies to create in Florida under the plan is far less than the 12,000 NASA and private jobs that Florida's east coast expects to lose when the shuttle is retired." "Most importantly, this achievement of the International Space Station proves, definitively, the existence of the worlds' potential for cooperation. Nations can peacefully work together towards a common goal--not unlike, say, Obama's goal of eradicating nuclear weapons. If NASA were to go commercial, as Obama hopes, the country would lose its ownership, and cooperation between multinationals--only concerned with their bottom lines and profits--wouldn't be nearly as idealistic as the cooperation between nations we have now." "The administration would like to foster commercial providers with our human space flight capabilities. Commercial participation is a good thing, and something that everyone agrees with, but it's simply not ready to take humans into space safely, and should not be the sole means for our country's access to space." "Much has been made of the fact that NASA will, as a consequence of Constellation's cancellation, have to rely on private firms to send its astronauts to the international space station once the space shuttle is withdrawn. In many ways, though, this is the least interesting aspect of what is happening, for what Mr Obama proposed is actually a radical overhaul of the agency." "That is what makes the debate over Constellation symbolic. The decision to abandon moon exploration has "decline" written all over it. Americans often profess astonishment that the Chinese of 600 years ago failed to take full advantage of their technological superiority. They invented gunpowder and, on the eve of Columbus's discovery of America, their ocean-going vessels were bigger and more seaworthy than Europe's." By Keith Cowing on February 5, 2010 9:13 AM. "OPM: The Federal Government will be open in the morning operating under an unscheduled leave policy with a planned 4 hour early dismissal. Employees reporting for work should be dismissed by their agencies 4 hours earlier than their normal departure time from work. OPM is continuing to closely monitor developing weather conditions should there be a need to reassess the Government's operating status." By Keith Cowing on February 5, 2010 12:30 AM. 1. Full-cost recovery has been cancelled (IFPTE's #1 workforce priority). The Agency will be going to a single unified CS labor account in FY11. In a letter from Administrator Bolden on Monday, he assured the Union that: "Going forward, it is also NASA's intention to work with the Congress to implement a unified labor account for FY 2011. NASA remains committed to full-cost workforce planning, to including labor estimates in our project baseline, and to complete transparency in workforce utilization at HQ and the Centers; however, we think it very valuable to unify labor into a single account for budget purposes." By Keith Cowing on February 4, 2010 9:45 PM. "NASA's proposed budget "essentially decimates America's human space-flight capacity," said Democratic Rep. Donna Edwards of Maryland Rep, Ralph Hall of Texas, the ranking Republican on the full Science and Technology Committee, said "it is naive to assume that a do-over will somehow deliver a safer, cheaper system faster than the current path we are on." The reaction portends an uphill fight for the Obama Administration, partly due to sentiment on Capitol Hill that it failed to consult members before unveiling such a dramatic shift in direction In an interview Tuesday, NASA's Administrator, Charles Bolden, accepted part of the blame. "I could have done a better job of communicating" with Congress, he said. "I will take the hit for that." "The potentially seismic shift for the aerospace industry was announced Monday, the seventh anniversary of the loss of the space shuttle Columbia, and came as defense companies were bracing for a pullback in the Pentagon's spending on weapons." "Giving up on manned space flight doesn't mean we have to give up on the exploration of the solar system. The president's budget calls for spending $19 billion on NASA, and for much less than the cost of sending a few astronauts once to a single location on Mars we could send hundreds of robots like Spirit and Opportunity to sites all over the planet." By Keith Cowing on February 4, 2010 7:58 PM. Keith's note: The NASA IPP NASA Commercial Space Initiatives Team Meeting is meeting on 9 Feb. Who knew? No Federal Register notice, no mention on the NASA IPP home page - no mention anywhere at NASA.gov. You would think that with all of the recent emphasis on commercial space in the new Obama space policy that NASA would want these events to be widely known and heavily attended. Guess not. By Keith Cowing on February 4, 2010 4:21 PM. "... the president and NASA have crafted a bold plan that truly makes possible this nation's dreams for space. Their plan calls for the full embrace of commercial solutions for transporting astronauts to low Earth orbit after the space shuttle is retired this year. This frees NASA to do what it does best: deep space exploration, both robotic and human. By selecting commercial solutions for transportation to the international space station, NASA is empowering American free enterprise to do what it does best: develop technology quickly and efficiently in a competitive environment." Keith's note: The director of the highest grossing movie of all time - a movie overtly about space exploration, a former member of the NASA Advisory Council, writes a glowing OpEd in a prominent national newspaper in support of the new White House's space policy - and yet NASA cannot find a way to make mention of it - any where? Not even a single Twitter posting? At a time when a lot of people are hammering NASA and the Administration over this new space policy, one would think that NASA would be looking for good news wherever they could find it. Guess not. By Keith Cowing on February 4, 2010 1:13 PM. "NASA has released the most detailed and dramatic images ever taken of the distant dwarf planet Pluto. The images from NASA's Hubble Space Telescope show an icy, mottled, dark molasses-colored world undergoing seasonal surface color and brightness changes. Pluto has become significantly redder, while its illuminated northern hemisphere is getting brighter. These changes are most likely consequences of surface ice melting on the sunlit pole and then refreezing on the other pole, as the dwarf planet heads into the next phase of its 248-year-long seasonal cycle. Analysis shows the dramatic change in color took place from 2000 to 2002." By Keith Cowing on February 4, 2010 12:35 PM. "Together with a piece of Everest's summit, also retrieved by Parazynski, the plaque-mounted moon rocks will be displayed inside Tranquility's new seven-windowed Cupola to inspire the astronauts working there. "Imagine being in the Cupola and looking out this huge series of windows and looking at the Moon and having a piece of the Moon right next to you. What's that going to be like? I have no idea. I'll come back and tell you," said STS-130 mission specialist Stephen Robinson. 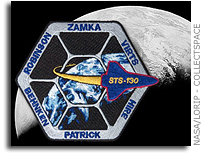 Robinson had a role in including aboard the flight another, albeit subtle, nod to NASA's lunar exploration history in the form of his and his crewmates' mission patch. The six-sided emblem, which was shaped to resemble the Cupola viewing port attached to Tranquility's side, depicts the Earth as it was first seen in a photograph taken from the Moon by Lunar Orbiter I." Keith's note: Not only is STS-130 carrying the Moon rock that I carried to Nepal and slept with for a month and Scott then carried to the summit of Mt. Everest, but I just learned that the STS-130 patch was inspired by the "earthrise" photo that Dennis Wingo and our team at the Lunar Orbiter Image Recovery Project released in Nov. 2008. It usually takes quite a lot to leave me speechless - this comes very close to doing so. How do we expand on such resonant opportunities so as to allow not just a few - but rather millions of people to have a similar, personal connection to what we do in space? By Keith Cowing on February 4, 2010 12:16 PM. "NASA and General Motors are working together to accelerate development of the next generation of robots and related technologies for use in the automotive and aerospace industries. 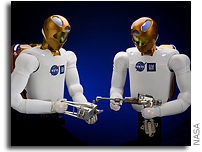 Engineers and scientists from NASA and GM worked together through a Space Act Agreement at the agency's Johnson Space Center in Houston to build a new humanoid robot capable of working side by side with people. Using leading edge control, sensor and vision technologies, future robots could assist astronauts during hazardous space missions and help GM build safer cars and plants." Keith's note: I certainly hope that NASA and GM are going to create a road show for these cool-looking robots. Once you have built one or two then building multiple copies starts to get cheaper. NASA and GM should put them on display and then invite the public into GM plants across the U.S. to see them in action. Show how NASA technology is going to help the U.S. auto industry thrive and rebound as well as explore space. Take the robots to local schools and local chamber of commerce events and let people try them out for a drive, so to speak. Make certain that flyers and other promotional materials are in EVERY GM dealership in America and that very new GM car has something in the drivers sear about these robots to go with it. Put the robots in a GM TV commercial. Work with Mattel or other toy companies to make action figures. Work with Legos to make small hobby versions of the robot - indeed have school competitions where kids are encouraged to make their own copies. This is a Education and Public Outreach activity that is just begging to be implemented. If NASA can lavish lots of attention on a fake robot like Buzz Lightyear one would hope that they could do the same for the real thing. By Keith Cowing on February 3, 2010 10:21 PM. That's what we should say to President Barack Obama in light of his Fiscal Year 2011 space budget for NASA. The President courageously decided to redirect our nation's space policy away from the foolish and underfunded Moon race that has consumed NASA for more than six years, aiming instead at boosting the agency's budget by more than $1 billion more per year over the next five years, topping off at $100 billion for NASA between now and 2015." By Keith Cowing on February 3, 2010 3:27 PM. "In anticipation of the President's new vision for NASA, I have been working closely with the NASA senior leadership team to ensure that we are ready to take on the opportunities we have been given. Early last fall, I asked Deputy Administrator Lori Garver to lead an Institutional Readiness Project (IRP) that focused on improving the area of institutional management. She and the IRP Team can be credited with surfacing progressive ideas that culminated into recommendations for organizational changes. Accordingly, I have notified the Congress that I intend to implement some organizational changes at NASA." By Keith Cowing on February 3, 2010 3:25 PM. "At a National Press Club event to "introduce new commercial space pioneers," the President's Science Advisor John Holdren and NASA Administrator Charles Bolden yesterday praised the seven winning companies of NASA's Commercial Crew Development (CCDev) and Commercial Orbital Transportation Services (COTS) competitions." By Keith Cowing on February 3, 2010 9:29 AM. By Keith Cowing on February 2, 2010 9:06 PM. "NASA Administrator Charles Bolden outlines the Administration's fiscal year 2011 budget request as the agency's road map for a new era of innovation and discovery, and answers questions from reporters as the featured Newsmaker at the National Press Club in Washington Feb. 2"
Keith's note: If you go to 55:18 in this video, I ask Charlie Bolden how he is going to get people to make the transition from flying government-operated spacecraft to commerically- operated spacecraft - and the emotion that goes with making the transition from one way of thinking to another. Bolden's reply gets deep into the emotions and mindsets that underly the changes that the Constellation workforce is now going through - and how he is going to work through that process with them. Continue reading Bolden Talks About The Constellation Team. By Keith Cowing on February 2, 2010 8:25 PM. Keith's note: I can totally understand this. We went through an identical mindset at the Space Station Freedom Program Office in 1993. Something we had worked very hard on was taken away from us - unfairly, so we believed. We wanted to fight back - to tell the truth. But all we had was fax machines and email. FWIW it is out of my personal frustration with this experience that NASA Watch eventually emerged a few years later. As time passed, and the bitterness faded, and the ISS became what it is, all of us from Freedom program eventually realized that "ISS" or "Alpha" was indeed "Freedom" after all. It was also clear that while a lot of what we did ended up in boxes sent off to recycling, that a small part of our efforts - our creativity - and our souls - ended up on orbit. That will happen for the Constellation folks as well. Charlie Bolden talked about this today at the National Press Club in response to a question I asked. If y'all want to use NASA Watch to vent, be my guest. I'll let you post without any commentary from me. I have omitted all unnecessary detail. But this email has been getting very very wide circulation within CxP. In the vein of 'not going down without a fight, 'one of our key I-X members put together this video after hearing about the proposed demise of CxP. It's a great memory of how far we have come in making real stuff in such a short time. You have to love our collective team. Continue reading CxP Fights Back: The Video. By Keith Cowing on February 2, 2010 7:50 PM. "Already, Sen. Bill Nelson, D-Fla., plans to use a Feb. 24 hearing to explore the feasibility of continuing with Ares I testing in the hope of developing a "light" version of the Ares V cargo launch vehicle "so America isn't relying only (on) commercial vendors," a spokesman said via e-mail." "Hatch has played a vital role in helping Utah's NASA contractors diversify their manufacturing base and products. Over the past three years, for example, he helped secure nearly $30 million for ATK/Hill Air Force Base's Advanced Automated Composite Technologies and Manufacturing Center." "Representative Gabrielle Giffords should immediately resign as Chair of the Space and Aeronautics Subcommittee. She has a clear conflict of interest from the tens of thousands of dollars her campaign has received from the aerospace industry. She took in over $10,000 in one day alone from people at large corporations such as ATK, Boeing, Lockheed Martin, and United Space Alliance. These are companies who stand to make or lose millions of dollars based on decisions made by her subcommittee." "In a statement, U.S. Sen. David Vitter, R-La., said he was concerned about the shift in the space program's direction, saying it would be devastating for Michoud. He said he favored a plan building on existing technologies based on the shuttle. "But we should do it now, not just talk about it vaguely for the future and lose all of our human capital and expertise and Michoud and other centers," said Vitter, a member of the Senate Commerce Subcommittee on Science and Space." "President Barack Obama's proposal to kill NASA's moon program and replace it with commercial rockets has drawn the ire of both Democrats and Republicans, who protest the move is either a "death march" for human spaceflight or a "radical departure" that will cost thousands of jobs." By Keith Cowing on February 2, 2010 5:36 PM. By Keith Cowing on February 2, 2010 5:33 PM. "A half century ago the Mercury Seven embodied America's space future. Now it's the merchant seven - space companies for hire. Mimicking a scene 51 years ago when the Mercury astronauts were revealed, NASA's boss beamed Tuesday as he introduced the "faces of a new frontier:" representatives of the seven companies that NASA is funding to develop future private spacecraft." By Keith Cowing on February 2, 2010 5:13 PM. 1. National prestige. Many decisions are made in other countries based on how they perceive us . Are we young and dynamic and growing or are we old, lethargic, and dying? If we are considered the latter, we will be attacked in both overt and subtle ways. 2. Growing our economy based on technological and scientific leadership. If we accomplish great engineering and scientific tasks, such as going to the moon and staying there, we will attract the best and brightest minds in the world to not only help us on the moon but to keep us advancing in all technologies. This equals a dynamic, nimble, robust, long-term economy. ...."
By Keith Cowing on February 2, 2010 8:29 AM. "Many of the projects GAO reviewed experienced challenges in developing new or retrofitting older technologies, stabilizing engineering designs, managing the performance of their contractors and development partners, as well as funding and launch planning issues. Reducing the kinds of problems this assessment identifies in acquisition programs hinges on developing a sound business case for a project." By Keith Cowing on February 2, 2010 8:15 AM. By Keith Cowing on February 1, 2010 10:16 PM. Keith's note: Now that NASA has been directed by the White House to cancel Constellation, and with it, all of NASA's big time lunar ambitions, I wonder when they will start to yank things like this sad dancing Moon walker animation offline. Seriously - this is not an insignificant task since there is an immense amount of VSE-related material that NASA has put online since 2004 that will now need to be modified or deleted. In addition, many third party websites contain large amounts of this material as well. And when do you start? Now? When Congress gives up trying to stop this cancellation? Imagine that there was an Internet in 1967 and you had to erase the Apollo program. By Keith Cowing on February 1, 2010 9:46 PM. "[Rep. Bill] Posey said he fears the plan represents a "slow death" of the space program." "Turning to NASA, the space agency's budget request represents a radical departure from the bipartisan consensus achieved by Congress in successive authorizations over the past five years. This requires deliberate scrutiny. We will need to hear the Administration's rationale for such a change and assess its impact on U.S. leadership in space before Congress renders its judgment on the proposals." "The cancellation of Orion is especially troubling and goes against the recommendations of the Augustine Commission. The State of Florida has made significant investments to prepare KSC facilities for Orion, and the Space Coast anticipated, invested in, and planned for the commitment to be fulfilled in order to help preserve jobs." By Keith Cowing on February 1, 2010 9:40 PM. "NASA Administrator Charles Bolden announced the administration's fiscal year 2011 budget request Monday by calling for change and a new era of innovation in America's approach to science and space exploration. On Tuesday, Feb. 2, the associate administrators of the mission directorates will hold teleconferences to discuss the budget's impact on their specific areas." By Keith Cowing on February 1, 2010 8:54 PM. "Through an open competition for funds from the American Recovery and Reinvestment Act of 2009, NASA has awarded Space Act Agreements to Blue Origin of Kent, Wash.; The Boeing Company of Houston; Paragon Space Development Corporation of Tucson, Ariz.; Sierra Nevada Corporation of Louisville, Colo.; and United Launch Alliance of Centennial, Colo. The agreements are for the development of crew concepts and technology demonstrations and investigations for future commercial support of human spaceflight." By Keith Cowing on February 1, 2010 6:38 PM. By Keith Cowing on February 1, 2010 6:29 PM. "To abandon Ares I as a baseline vehicle for an alternative without demonstrated capability nor proven superiority (or even equivalence) is unwise and probably not cost-effective." In the weeks and months ahead we are hopeful that the Congress and Administration will work together to deliver a budget that supports a program that capitalizes on the investments the nation has made in the Constellation program, closes the gap in US capability to return to space, and best assures continued US leadership in space. We believe ATK will continue to play a significant role in America's future space exploration." By Keith Cowing on February 1, 2010 3:14 PM. "The Next Step in Space Coalition and the Commercial Spaceflight Federation, two organizations representing businesses, organizations, and people working to ensure the future of U.S. human spaceflight, today will hold a joint teleconference for members of the media. Top CEOs of the commercial spaceflight industry will provide comments on the National Aeronautics and Space Administration (NASA) FY2011 Budget." By Keith Cowing on February 1, 2010 2:00 PM. "In announcing its $19.0 billion FY 2011 NASA budget today, the Obama Administration has made it very clear that it intends to attempt a paradigm shift in the way that America explores and utilizes space. The current plan NASA is following will be cancelled. But the intent to explore will remain and will be reconfigured into a new plan that openly taps private sector creativity while making certain that the taxpaying public is involved in an unprecedented fashion. This plan for change comes with additional funds - to the tune of an additional $6 billion over FY 2011 to FY 2015 when compared to what the FY 2010 budget anticipated - approximately $700 million of which will appear in FY 2011. That means that NASA will get $100 billion over the next 5 years according to the White House's plans. In so doing, the White House is hoping to make a clean break with much of the old way of doing things at NASA. As they do, NASA will be pushed to broaden its vision, seek new partnerships, and transform its way of doing things. This will be unsettling to many people. However, that break begins with some hard choices - most notably, the outright cancellation of The Constellation Program. Started shortly after President Bush announced his "Vision for Space Exploration" in 2004, Constellation was the umbrella activity for what eventually became development activities for the Ares launch vehicle family, the Orion crew module, and the Altair lunar lander. All of this now comes to a halt." By Keith Cowing on February 1, 2010 1:56 PM. Keith's note: I asked NASA Deputy Administrator Lori Garver "While NASA has certainly been at the forefront of using new media - social media etc. - to connect with the public it still has a long way to go to catch up with how people actually learn and communicate in the real world. As you well know Education and Public Outreach at NASA is all too often an afterthought or a "nice to have" activity. Yet it is often the only way that the public really comes to understand what NASA does since press releases are aimed at the media - not real people. There has been a lot of talk about something NASA calls "participatory exploration". Can you elaborate on the new ways that NASA will engage the public and describe the priority for such efforts from an overall agency perspective." Lori replied "The budget has $5 million to do this sort of thing. When we look at robotic prcursor missions - not only will we land - but we will have milions of people travelling along with us - with robots that can be controlled from Earth by students. This will be an oportunity for the taxpaying public who owns this program to participate. We hope to take take a page from DARPA and allow people to utilizing the science we develop. This is the people's program and we are giving it back to them." By Keith Cowing on February 1, 2010 12:39 PM. By Keith Cowing on February 1, 2010 12:36 PM. By Keith Cowing on February 1, 2010 11:38 AM. "Our focus must be on jumpstarting the economy and creating jobs through policies that spur economic growth in the private sector. The path to economic recovery and sustained growth runs through the private sector, not the federal government." "We cannot continue to coddle the dreams of rocket hobbyists and so-called 'commercial' providers who claim the future of US human space flight can be achieved faster and cheaper than Constellation. I have consistently stated the fallacy of believing the cure-all hype of these 'commercial' space companies, and my position has been supported time and again by both the experts and the facts." By Keith Cowing on February 1, 2010 10:28 AM. Keith's note: NASA 2011 Budget information is now online at OMB: "NASA's Constellation program - based largely on existing technologies - was based on a vision of returning astronauts back to the Moon by 2020. However, the program was over budget, behind schedule, and lacking in innovation due to a failure to invest in critical new technologies. Using a broad range of criteria an independent review panel determined that even if fully funded, NASA's program to repeat many of the achievements of the Apollo era, 50 years later, was the least attractive approach to space exploration as compared to potential alternatives. Furthermore, NASA's attempts to pursue its moon goals, while inadequate to that task, had drawn funding away from other NASA programs, including robotic space exploration, science, and Earth observations. The President's Budget cancels Constellation and replaces it with a bold new approach that invests in the building blocks of a more capable approach to space exploration." Page 18: National Aeronautics and Space Administration: "The Administration proposes to cancel the Constellation Systems program intended to return astronauts to the Moon by 2020 and replaces it with a bold new approach that embraces the commercial space industry, forges international partnerships, and develops the game-changing technologies needed to set the stage for a revitalized human space flight program and embark on a 21st Century program of space exploration."